Arriving in Pokhara on a beautiful Saturday afternoon was a great transition from being at the Monastery. I couldn’t have asked for a better day; bright sunshine, clear blue skies and few tourists (it is still technically monsoon season here). I had met two Nepali woman on the bus who took care of me, making sure that I had language lessons while we were travelling and getting me a cab for a local rate when I arrived. I found a beautiful guesthouse up on a hill overlooking the lake and the World Peace Pagoda across the way. 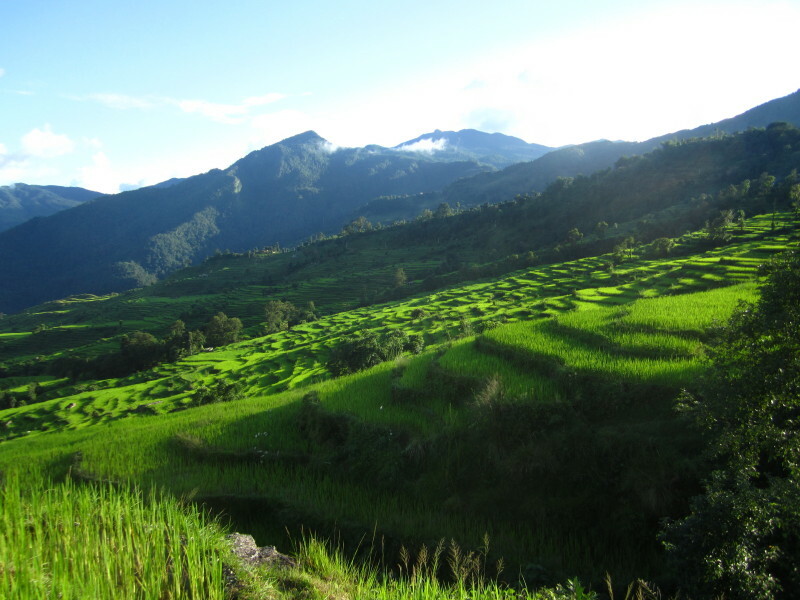 There is no path to this place, it is accessible only by walking along the ridges in the rice paddies. 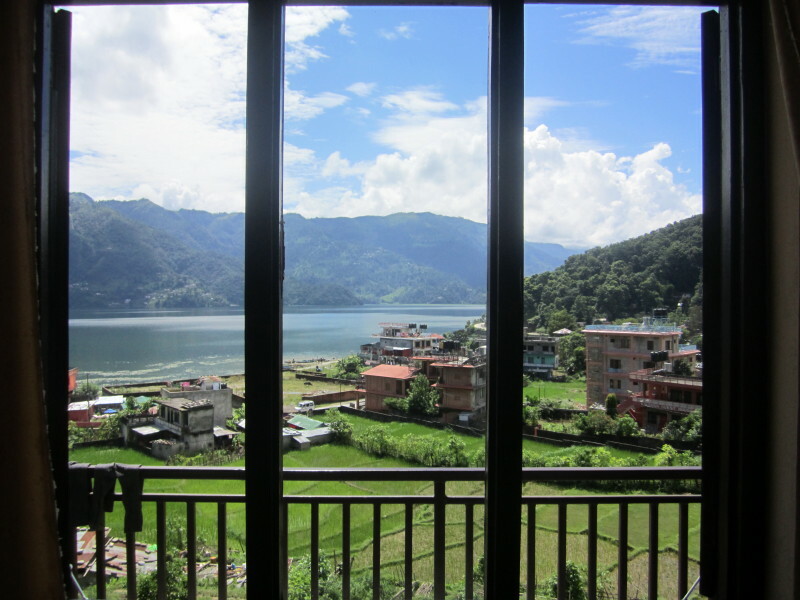 The town of Pokhara is a great place to meet people. It seems like everyone I talk to has come here for a short visit and ended up staying, many for months. I can completely understand this. It is a beautiful area. The lake is surrounded by small mountains, which are then backed up by the Himalayas. 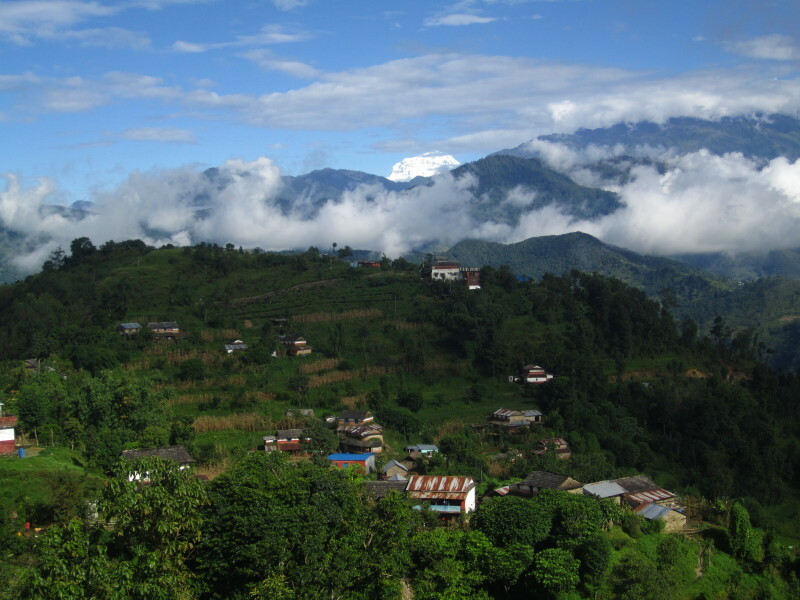 On a clear day, you can find a couple of good spots to get a view of the Annapurna range, with its beautiful snow-capped, rugged and crazy high peaks. As chilled out and comfortable as Pokhara is, I was quickly itching to get out of town and explore the incredible terrain. Luckily, my neighbour was also ready to go exploring. 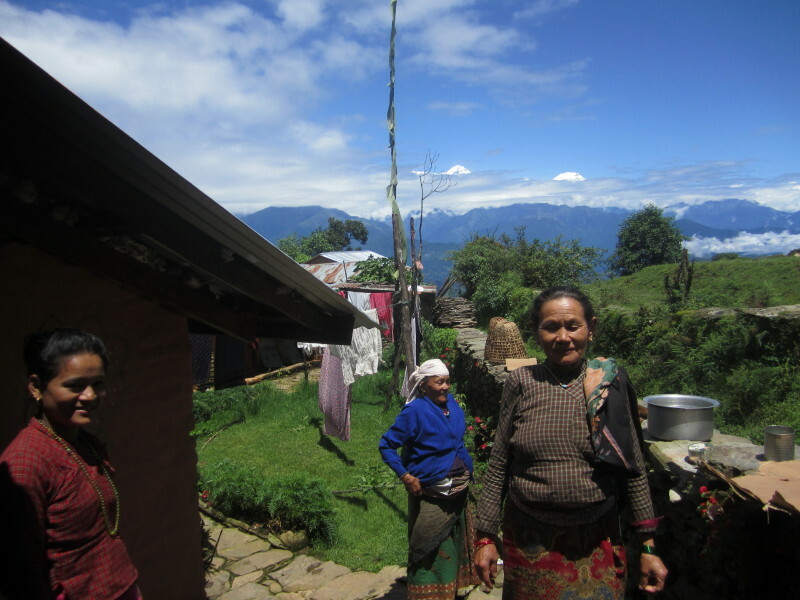 Together, we met another long-term traveller who was interested in coming along and the three of us sketched out a plan to head up to the Panchase Mountain, along the Panchase ridge trek over to the Sarangkot Lookout and back down to Pokhara. This would take us from about 900m up to 2100m the first day, then over, down and back up to 1600m the second day, and finally wrapping up back in Pokhara at 800m on the third day. I have learned that the treks here aren’t really discussed in terms of distance covered, but elevation and days taken. We met the next morning, had breakfast and got on the local bus (also the school bus) into the valley to get to the trail head. The bus took us as far as it could down a road that in spots was certainly not what I would have been able to identify as a road, before dropping us at the foot bridge crossing the river. Once on the other side of the river, we began to climb…up, up, up. It was a hike that made me realize that my fitness level is not where it used to be. However, I was able to keep up to Jan and Edo (who are both experienced trekkers) and was even able to keep from thinking the type of grumpy thoughts that usually invade my mind in the up portions of hikes, which made it a very good experience. We passed through some open areas where we could look down into the valley and get a proper appreciation of just how high we had climbed. It also quickly became apparent that this was not a high traffic route, as we passed only one other group of trekkers. It seemed that we had the whole mountain to ourselves. Going higher into the mountains, we came across our first secluded village. If you can close your eyes and picture what a post card of a Nepali Mountain Village would look like, then somehow make that even more stunning, this is what we were greeted with. Stone walls winding up through vibrant green paddies, leading up to a small collection of clay brick houses between which the buffalo lingered around the meandering mountain stream. This description still does not do it justice, but the image is one that I am sure I will revisit many times in my dreams. We kept going and soon came to a more level stretch of the path where we paused for lunch. The guys took a swim in the river while I became enthralled by the various different kinds of minerals and rocks in the stream (yikes, there’s my geo-geek coming through again). After a short flat section, we came to another village where I got my first glimpse of one of the snow-capped peaks of the Himalayas. We were standing on the path beside a stone fence, on the other side of which a woman was hunched over tending to the rice. She seemed a little surprised when I let out a huge gasp at the sight of the mountain. It may seem strange that the sight of mountain, which is logically just another landform, could send such shivers down my spine, but that is exactly what happened. I was awestruck! The clouds slowly revealed other peaks, changing the show and keeping me captivated. Eventually, we made it to our destination; a group of 3 guesthouses at the base of the Panchase peak. As we arrived, the mist rolled in around us giving the place a mysterious and sort of magical feel. We settled into our room, which consisted of four platform beds on a clay floor with a thatched roof in a house run by 3 generations of beautiful Nepali women (the grandmother with an infectious laugh), just as the rain started. It poured in the monsoon way until noon the next day. A the first sign of clearing we were off again. It was a late start, but the weather held out most of the way to our next stop, only clouding over for a misty walk through the woods that felt like we were walking through a secret fairyland. We arrived in a small village outside of Sarangkot just as dusk was turning into darkness, and found a room in a house below a field with a great view north to the mountains. 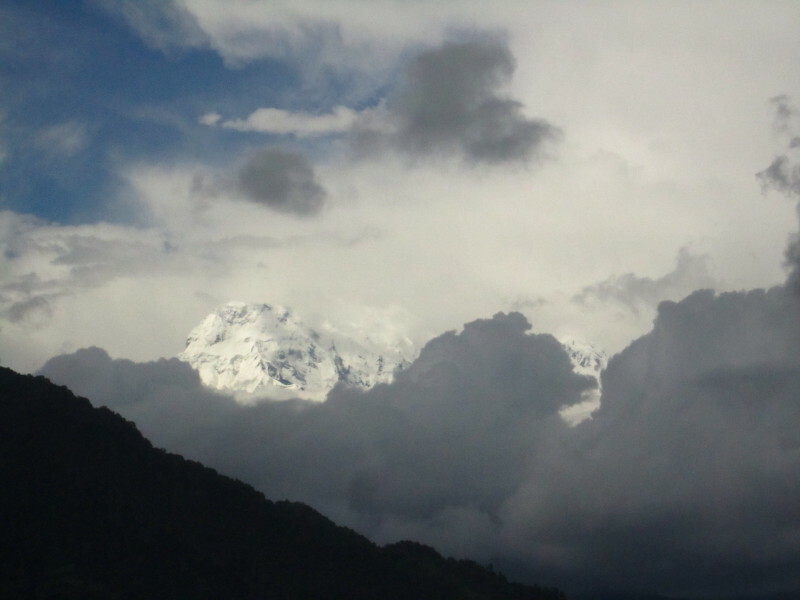 Early the next morning, we were given another Himalaya peak vs cloud spectacle. The three of us sat and watched as the view changed with the rolling clouds, and again I was awestruck. Soon, the show ended as the clouds closed in and our journey continued. We arrived in Sarangkot around 11:30am and had a good view of Pokhara and the Paragliders slowly winding their way into the valley below us. It was close to lunch time so we scoped out a good place for dal bhat (a trekking staple). As we sat waiting for the food, I snoozed and the guys chatted about their adventures around the world. The only thing left for us to do was to descend the windy trail back down to Pokhara, which was also the only portion of the trek that we did in the rain. It was nice to get back and drop my bag, but as soon as we were amongst the cafes, guest houses and other travellers, my heart was wishing we were back in the mountains, laughing with the 3 generations of ladies while squatting in the clay kitchen eating dal baht. It was a beautiful experience, and although I have rattled on and on about it, I could easily keep going. I now have a few days to relax and prepare myself before heading off for my next mountain adventure. Only this time, I will not just be looking across at the majestic Himalayas, I will be amongst them. 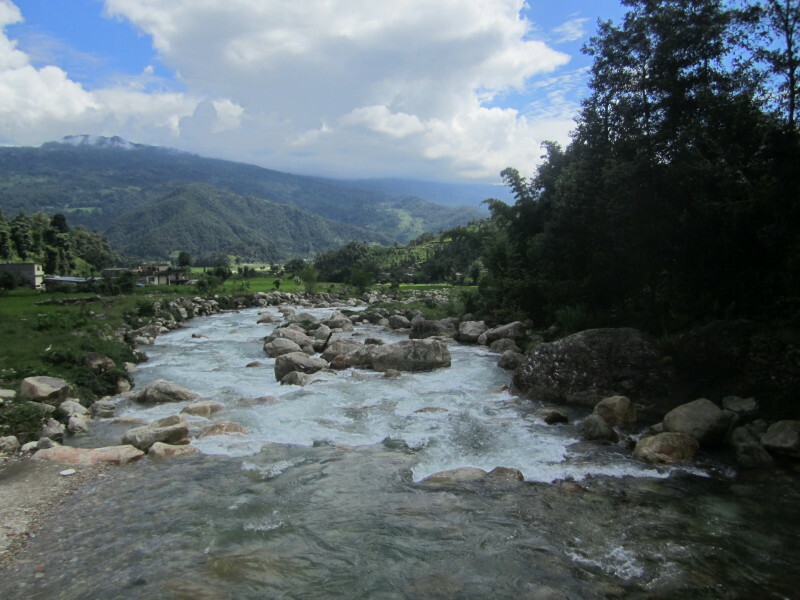 This entry was posted in Nepal, Traveling and tagged Nepal, Pokhara, Trekking, Village. Bookmark the permalink. Your pictures are beautiful and i am sure they don’t do the ‘real life’ view justice! They don’t even scratch the surface, but they are a great reminder for me. Miss you! I keep thinking about the kind of pictures someone like you could get here…you should add Nepal to your travels for sure! you write as though you truly enjoy being-in-the-world. Thank you Doug. I am certainly enjoying it! It just seems to get better and better. Loved this blog entry. The scenery is certainly quite breathtaking in the photos and I can only imagine how amazing it must be to actually be there. I am so pleased that you are seeing all this firsthand and am thankful to be able to appreciate the majesty of the Himalayas vicariously through you.